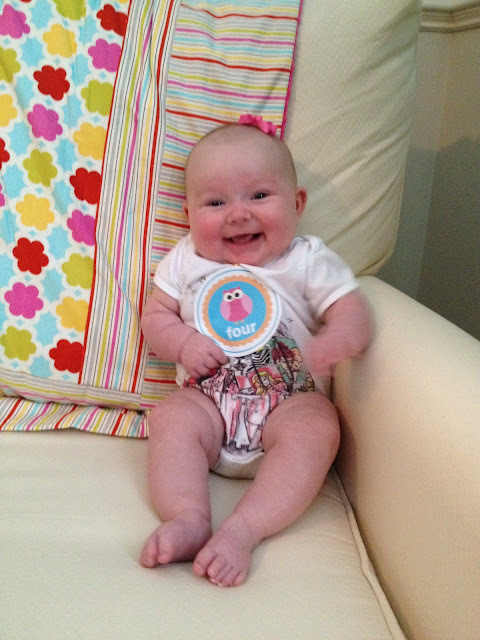 Baum Squad: The Baum Family Blog: 4 Months! We are en route to Charlotte for the long weekend, so the 4 month stats and check-up report will have to wait until tomorrow. In the meantime, I just wanted to wish my sweet baby girl a happy 4 months. Lillian Grace, you have brought us more joy than we ever knew we could experience, and we love you so much more than we know how to tell you. Thank you for teaching us what life is all about. We are so thankful for you! Love the Barbie onesie, Lilly!!! !